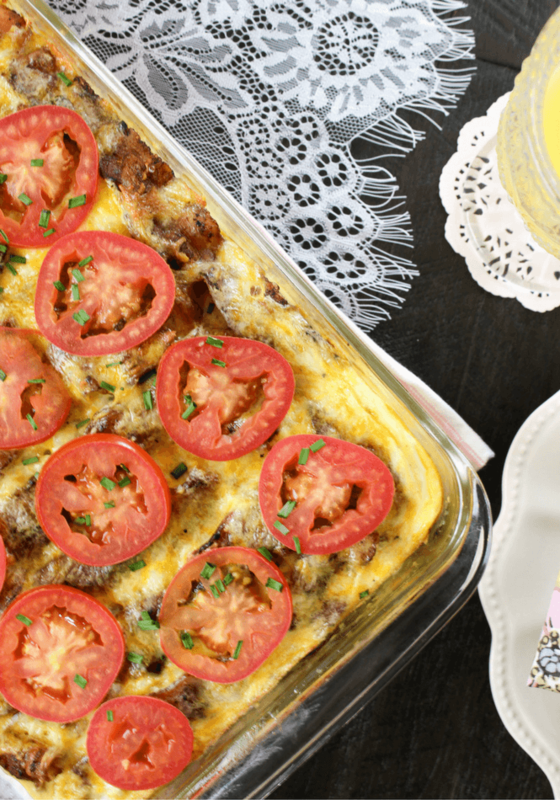 Bacon and Sausage Brunch Casserole is a perfect Mother’s Day recipe made with Jimmy Dean® Regular Premium Pork Sausage, Wright® Brand Hickory Smoked Bacon, hash browns, eggs, onion, garlic, Mexican cheese and Roma tomatoes. We are beginning our brunch journey with a trip to Meijer to check off all those items on the grocery list. From produce to fresh flowers to serving platters and so much more, Meijer stores have it all. 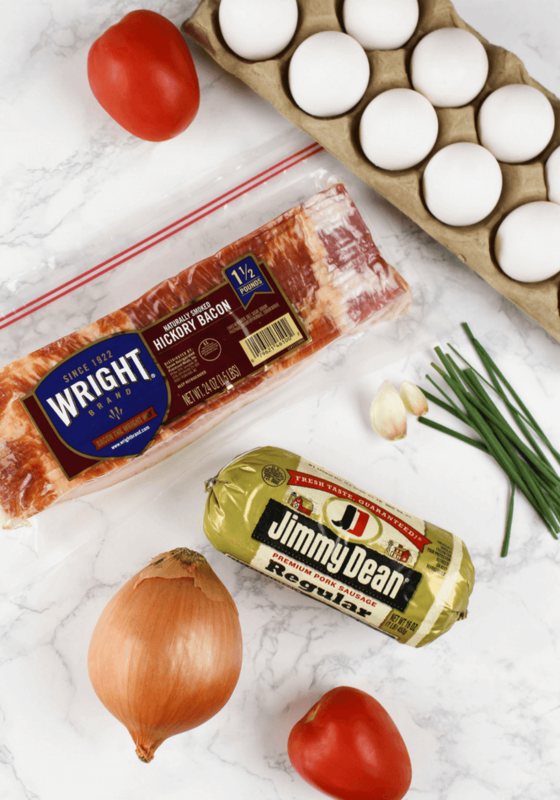 For this Bacon and Sausage Brunch Casserole, a visit to the refrigerated meats section is the first stop to grab Jimmy Dean Regular Premium Pork Sausage and Wright Brand Hickory Smoked Bacon. Also, keep an eye out for the new Jimmy Dean Hickory Smoked Bacon now available at Meijer, because bacon is life and you are going to want to try the bold smoky flavor in a slightly thicker cut. 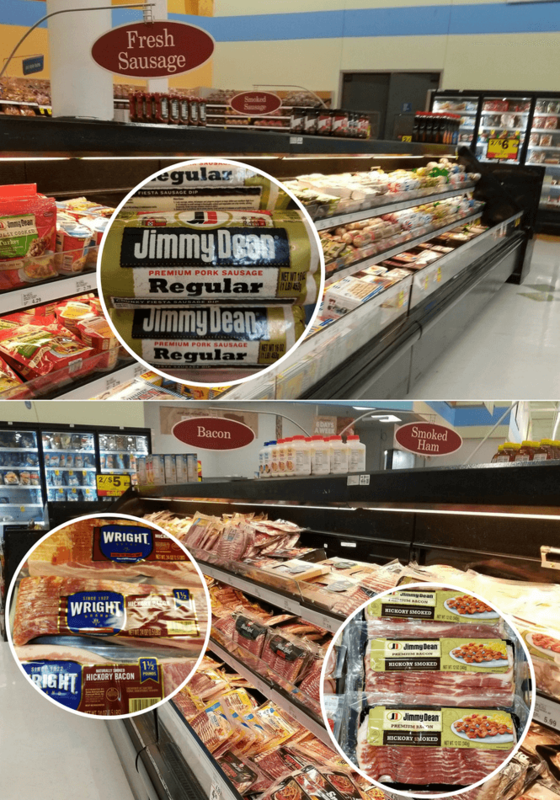 Be sure to be on the lookout for the special Mother’s Day stickers on Jimmy Dean and Wright Brand products at Meijer! Jimmy Dean Regular Premium Pork Sausage offers a high quality, savory pork sausage with a special blend of seasonings. Ideal for breakfast casseroles! Wright Brand Hickory Smoked Bacon is a naturally smoked bacon that is hand-trimmed and cut thick. You are going to want to eat this bacon as part of your breakfast, lunch and dinner. 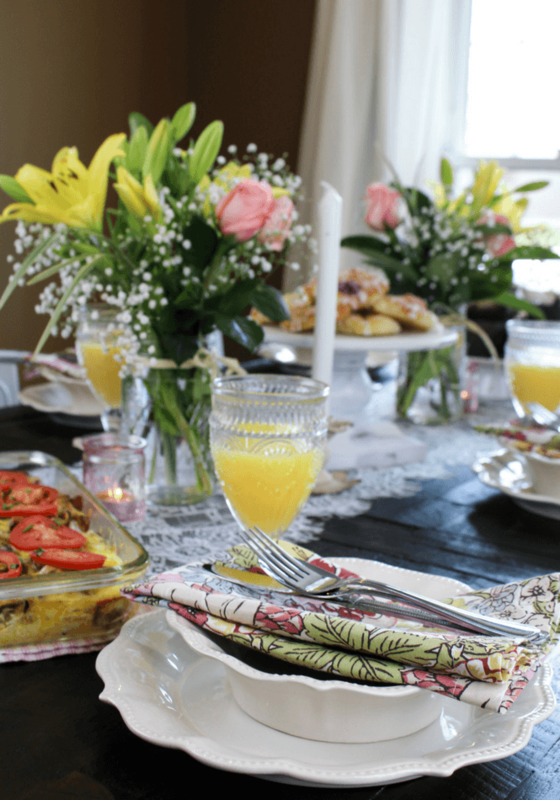 LOCATE A MEIJER STORE NEAR YOU TO PICK UP EVERYHTING ON YOUR MOTHER’S DAY BRUNCH MENU! CLICK HERE FOR THE STORE LOCATOR! I decided to go with a tablescape that was beautiful, yet simple. The lace table runner is my favorite part. I added some fresh flowers and candles and utilized cake stands wherever possible. I stuck to all white for the plates, table runner, cake stands and serving dishes to help keep the dining room bright and airy. 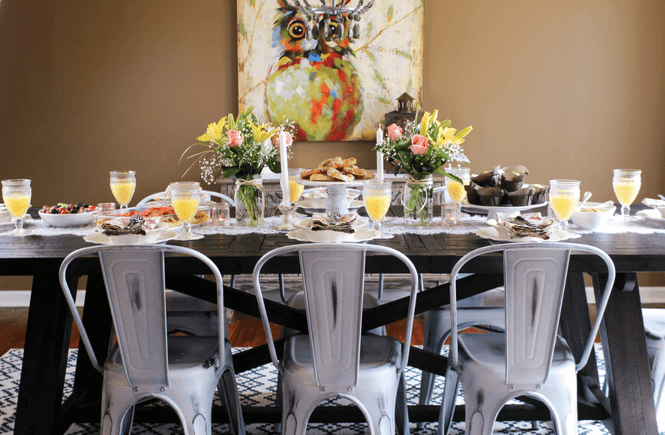 The floral napkins are a vintage find from a while back and inspired this entire table and set the tone for brunch. Fresh flowers for a pop of color. Cake stands for muffins and pastries. Serving platters, bowls and serving utensils. I used all white to keep the table bright and cheery. Plates, bowls, glasses and utensils for each guest. Bacon and Sausage Brunch Casserole. Recipe card below! Blueberry muffins. I used a simple box mix today with bakery style liners. Fresh fruit with strawberries, kiwi, blackberries and grapes. Orange juice. You can even set up a beverage bar with juice, water, coffee and some mimosas. Variety of pastries. 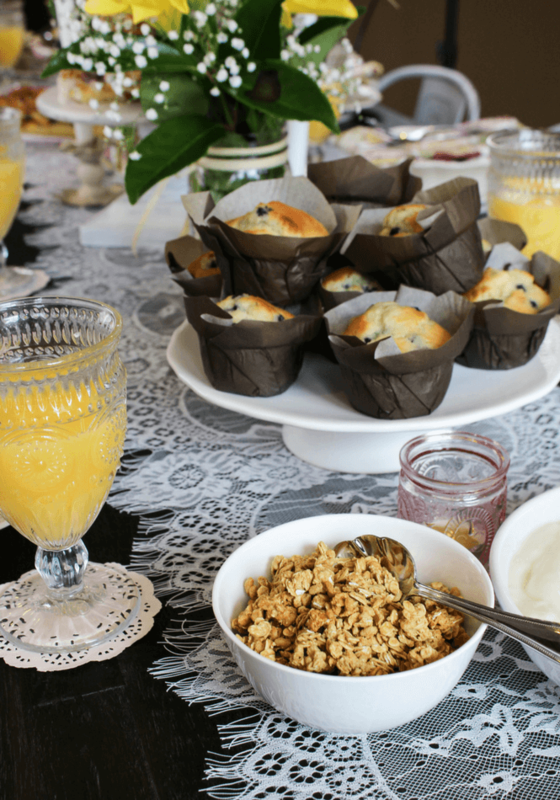 Some pastries from the bakery at Meijer are easy and delicious for a nice brunch treat. Let’s get to the best part! 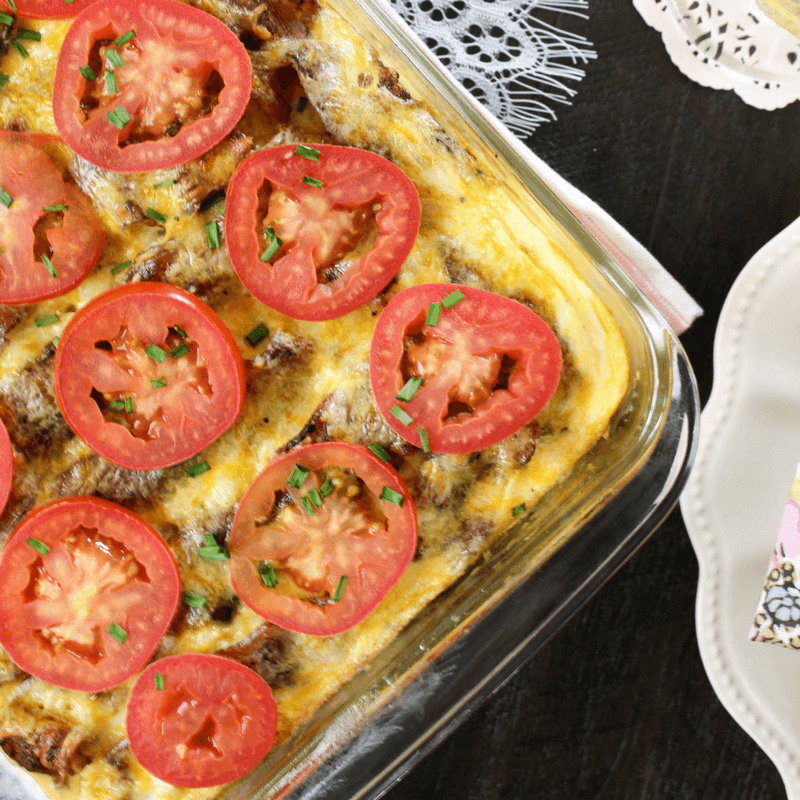 Our Mother’s Day Bacon and Sausage Brunch Casserole that is loaded with Jimmy Dean Regular Premium Pork Sausage and Wright Brand Hickory Smoked Bacon for a meaty main dish mom will love. Our menu has pastries, muffins, yogurt and fruit but a hot dish was needed to complete brunch. 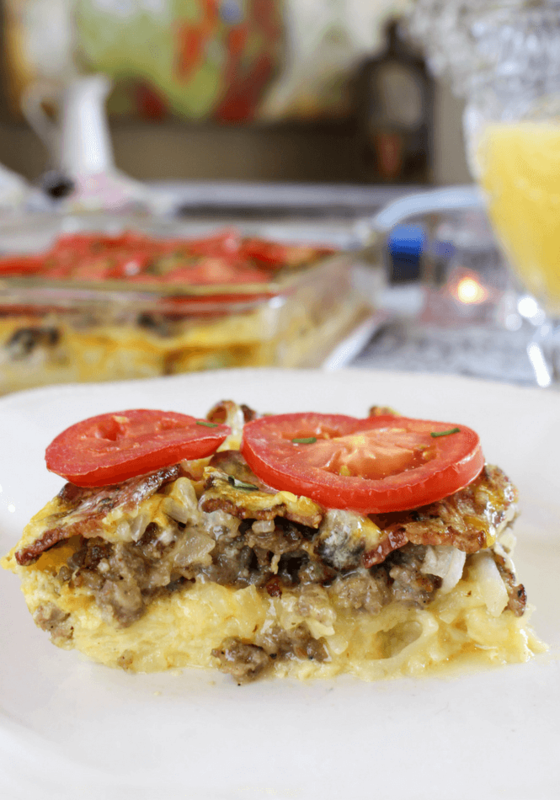 This Bacon and Sausage Brunch Casserole hits the spot with your favorite breakfast meats and the must have eggs and hash browns. 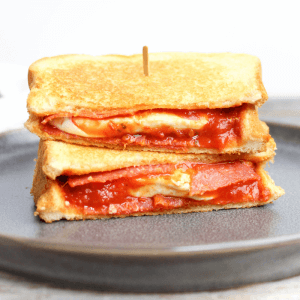 Plus, the tomatoes add some vibrant color to the top. This casserole is going to make your Mother’s Day! Make sure to click play on the short video at the bottom of the page to see how simple this casserole is. Finely chop half an onion, mince 2 garlic cloves, slice tomatoes and chop a few chives. On the stovetop on medium heat, cook your Wright Brand Hickory Smoked Bacon extra crispy, set to the side on paper towels. Dispose of bacon grease on the bottom of pan and place pan back on medium heat. Add Jimmy Dean Regular Premium Pork Sausage and brown meat. Place the sausage to the side in a bowl. Place pan back on stovetop and turn down heat a bit, add minced garlic and half a chopped onion. Stir for 2 minutes and set onion mix to the side in a bowl. In a mixing bowl, add eggs, salt, pepper, heavy cream, sour cream and cheese. Whisk thoroughly. Set to side. Assemble the casserole after spraying dish with non-stick spray. Place hash browns in the bottom layer. Use about 3/4 of a 1 pound bag. Add the cooked sausage, then the cooked onion. Spread out evenly. Add a layer of the cooked bacon slices followed by the egg mixture. Add tomato slices and chives, cook another 10 minutes. 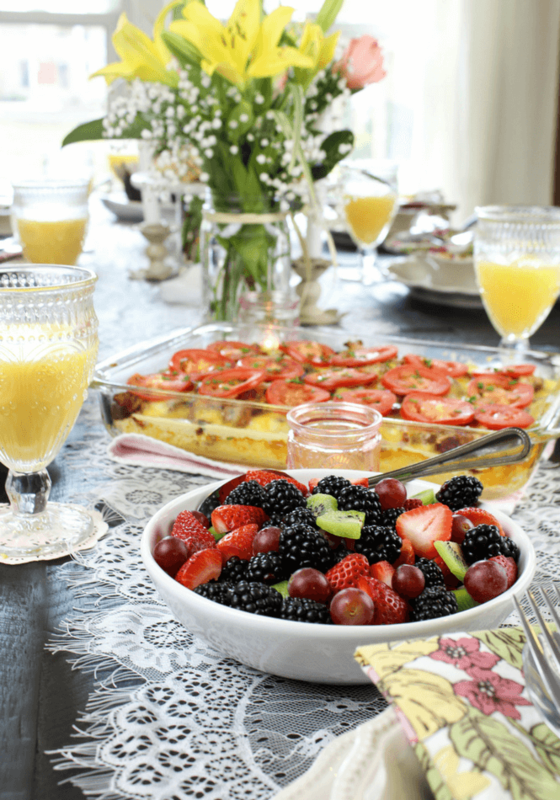 Do you have Mother’s Day brunch plans? Let me know in the comments below what you are giving your mom, and most importantly, what you will be feeding her! Oh I love good casseroles. This looks like a wonderful tablescape. I need to up my game a little because mine is boring. I’m sure it is fine! Just adding some clean linens and fresh flowers can really add a lot. Plus, try grabbing random items like the cake stands to add some interest on the table. You got this! This is beautiful and the food looks amazing! Such a beautiful post. Wow! Such a great Mother’s Day spread! If only my kids we’re old enough to cook, I would be one happy mama. Someday! Let them help cook breakfast for you to teach them for future Mother’s Day! Sounds so good! Brunch is my favorite meal to have guests over for 🙂 I will be saving this! Thanks Amanda. 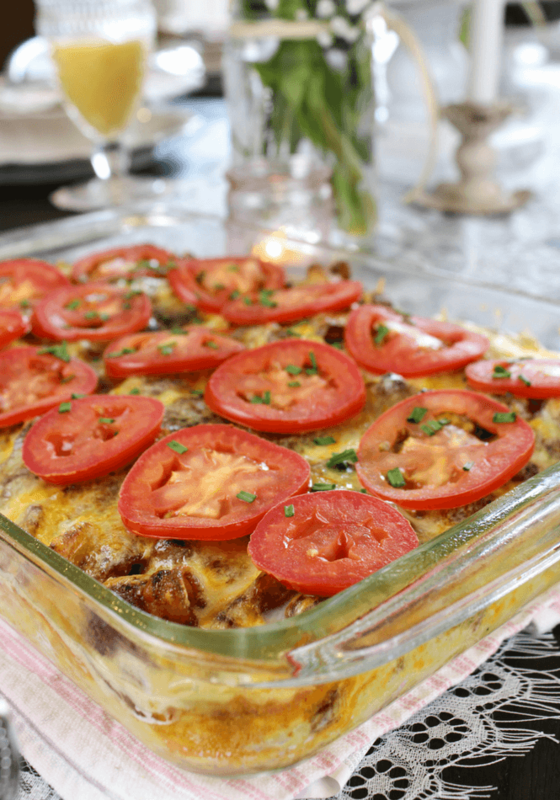 Breakfast casseroles are perfect for feeding guests. It is simple and everyone loves it. OMG your table looks amazing! The casserole is mouth watering. Did you purchase your chairs distressed or did you distress them yourself? I ask because I have 4 chairs and want the distressed look but am scared I will mess them up.